TENS & Microcurrent Massage Unit - JK TOP-Industrial Co., Ltd. The product is a new Health – oriented product to benefit the tired body. Due to its portable appearance, the use of the device will be no longer bound by time or space. It is really a good partner for health care in daily life. 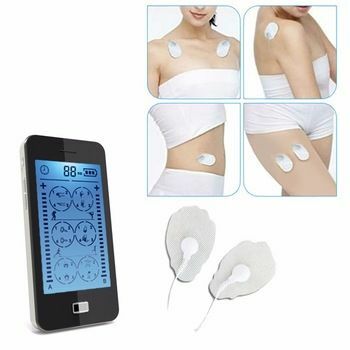 Transcutaneous electrical nerve stimulation is the use of electric current produced by a device to stimulate the nerves for therapeutic purposes. By definition, it covers the complete range of transcutaneously applied currents used for nerve excitation. Although the term is often used with a more restrictive intent, namely to describe the kind of pulses produced by portable stimulators used to treat pain. The unit is usually connected to the skin using two or more electrodes. The battery-operated unit is able to modulate pulse width, frequency and intensity. Generally TENS is applied at high frequency (>50 Hz) with an intensity below motor contraction (sensory intensity). Or low frequency (<10 Hz) with an intensity that produces motor contraction. While the use of TENS has proved effective in clinical studies, there is controversy over which conditions the device should be used to treat. Microcurrent is capable of facial stimulation, sending soft, gentle waves through the skin, tissues and down to the facial muscles. Microcurrent has been shown to stimulate ATP production. ATP is known as Adenosine triphosphate which drives the creation of key structural proteins, such as collagen and elastin, and is the biochemical way to store and use energy. This increased ATP also energizes the facial muscles, similar to how exercise energizes the muscles of our bodies. Unlike anywhere else on the body, the facial muscles are directly connected to the skin, so the result of energizing the muscle is often an improved, lifted appearance. Large touch screen. The large touched, clear LCD indicator makes it easier for visually impaired to set and operate, this LCD will be utilized to display stimulating mode/intensity level and timer. Stimulate inhibiting sympathetic, enlarge blood vessels, and improve blood circulation. Copyright 2019 JK TOP-Industrial Co., Ltd.